NFYFC chief officer James Eckley spoke to Farmers Guardian about the decision to cancel the annual convention. What actual revenue has the AGM generated over the last five years for NFYFC? And where will the shortfall of finances come from? On average, based on the last five years, the Convention makes approximately £144,000 per year – not taking into account the 2018 event (these figures are still being worked on). Generally the income is greater at the Blackpool event due to higher ticket sales. In 2019, the Board has agreed to use NFYFC’s reserves to cover the shortfall and allow the organisation time to put new plans into place. How many NFYFC members actually attended AGM this year, and of those how many took part in activities and events in the Winter Gardens? 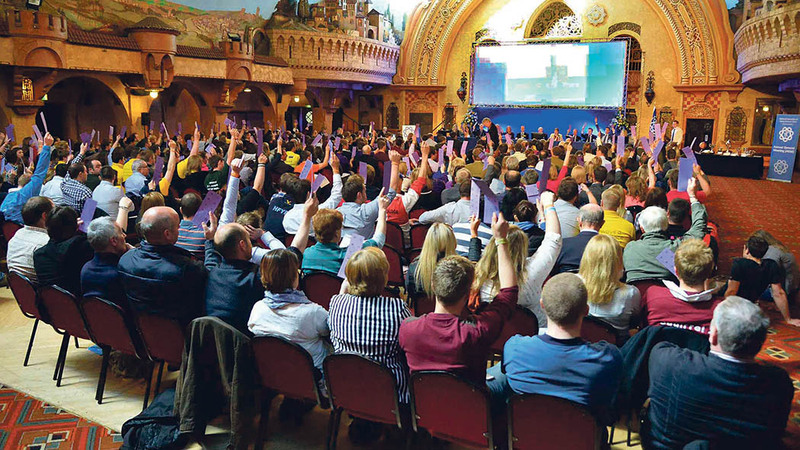 6,000 tickets were sold for Annual Convention, (although we are aware that the number of young farmers in Blackpool was higher than this but do not know the exact numbers of those people). Over the evening events in the Winter Gardens, the attendance peaked at over 5,000 on each night – but this was mainly when the headline DJs were on stage and not for the whole evening. In the day time, the numbers are much lower with only 260 people attending the AGRI Brunch, 360 in the darts/ quiz and 650 in the AGM. The competitions attract higher numbers – but these also include family members who just come to Convention to watch the performances. There were 1,800 people recorded in the Performing Arts competition and 2,400 in the Dancing competition (this number reduced over the course of the performances). Both Blackpool and Torquay have said they are keen to take Young Farmers back if an event is organised in future...is this something you would consider? We want to look forward not backwards and we plan to research with our members to get fresh and up to date ideas for the type of events they would like us to host. This is the time for YFC members to play their part in helping shape our future. It is important the national organisation delivers services that are inclusive for our entire membership age (10-26) including the highest governance meeting. It is also critical that we address some of the societal issues around drinking that are impacting on our own organisation. While we can lead this work from the national office, we need our YFCs to work together with us on recognising these issues and delivering change. What are your thoughts on Young Farmers organising their own similar event? We are discouraging large groups of young farmers from organising their own event in Blackpool or Torquay. This is to avoid repetition of the incidents that are growing in number year on year. We are in contact with the local authorities, including the police, about these pop-up events. We are aware local residents are concerned and we have warned YFC members that anyone who brings the YFC name into disrepute will be removed from the Federation. Do you think moving forward the event is just in need of rejuvenation - a mix-up in the more serious parts of the weekend including agri-affairs brunch and AGM? No, not in its current format. We are seeing a rise in incidents happening outside of the event, with bars and clubs in the towns offering entertainment day and night. They are working hard to appeal to YFC members and host their own parties that are now competition for our event. This is resulting in members just coming to Blackpool and not buying tickets. The party in the town, and the growing number of incidents of anti-social behaviour, are increasingly difficult for NFYFC to manage, whilst running its own event. NFYFC has repeatedly tried to tackle these issues over the last few years at a club and county level, with presentations on behaviour, creating group leader roles for Convention and removing members – where they can be identified – who have gone against the code of conduct. We have asked counties to work with us on this and explained the issues. We have had very few identifications from counties and clubs in helping us to find people who caused anti-social behaviour during the weekend. We work closely with the local authorities in the run up to each event and have close contact with the police during the weekend. The number of arrests in 2018 was low but the number of complaints from members of the public was extremely high – creating a generally negative impression of YFC and the work it does because of the wide-spread poor behaviour across the town. There has always been a mix of more serious elements to the weekend but fewer than half of the YFC members who have bought a ticket to the Convention, attend these events in the daytime. This is why the location and format need a complete re-think. NFYFC is now spending even more time after the event trying to resolve the issues that have occurred during the weekend. This is time that should be spent on developmental work with YFCs and offering vital services for members. Instead the small staff team at the office is spending hundreds of hours on managing the negative fall-out from the event. It is time for change. This is why Vision:2023 is so important. Vision:2023 is the name we have given to our new five-year plan – and in the next few weeks and months members will start to see the ways they can get involved in this future planning. We want the membership to help steer the types of events and activities – and for us all to re-think the style of events we hold. These should be accessible to and inclusive of the whole membership aged 10 to 26 and focus on the true YFC rather than providing a platform for excessive drinking. We have a vision to improve the organisation over the next five years and have set ourselves a goal of completing this progression by 2023. Changes will take place incrementally as we move along our five-year journey and will encompass much more than just what kind of event we put on in the future. Although, as we know this is important to the membership, a future event that is available to all of our membership (involving those aged 10-17 too) will form a big part of the plan. Were members consulted on the decision to cancel AGM via council, or if not did they have any say in it at all? If not, why not given the democracy that NFYFC prides itself on? NFYFC consulted with its Council members at the June meeting. Evidence was presented to them and the issues involved with hosting this event were discussed at length. At this meeting, members of the Board also informed Council that a decision about the Annual Convention would rest with the Board and be made at their July Board meeting. Members of Council were tasked with gathering feedback on how their counties were going to work on behavioural issues at a club and county level. This consultation needed to happen despite any outcome with regards to convention. The results of this exercise will feed into future planning and are to be discussed by the Board and again at the October council meeting. The original focus of the Board’s decision was about the 2019 event but after much scrutiny it was felt that it would be impossible to hold the event again in its current format for the insurmountable reasons why the 2019 event had to be cancelled. The reason the Board made the decision and not YFC members is because they are responsible for safeguarding the organisation’s finances, reputation and future. The Board members are personally liable for the organisation as its trustees. In this instance, it was impossible to be able to give every member a complete understanding regarding the scale of the problem. However, NFYFC has spent the last three years clearly highlighting the potential of reputational damage and the need to modify behaviour directly to the members buying tickets and to Council and County Federations. Council members appoint the Board and 66 per cent of the Board are YFC members. The Board also took into account the feedback from Council and from County Federations about the future. We also reviewed the many pieces of feedback that we received from members sharing their disappointment following this year’s Convention coverage of anti-social behaviour. The Board also considered the feedback from Blackpool residents and stakeholders – as well as any feedback we received in Torquay.